1. Heat the olive oil in a large saucepan, and cook the onion for 4-5 minutes until beginning to soften. Add the minced beef, and cook with the onion until it is browned all over, breaking up with a wooden spoon as you go. 2. Stir in the carrots and butternut squash, and toss together with the mince and onions cooking for just a few minutes, then stir in the chilli and ginger, and cook for a further minute. 3. Add the curry paste and chopped tomatoes, and mix, then add the stock and mango chutney. Simmer for 25 minutes until the vegetables are tender. 4. Meanwhile, place the rice in a small saucepan and cover with cold water about 3cm above the level rice. Bring to the boil and simmer until all the water has been absorbed by the rice. Remove from the heat, cover and leave to sit while the soup is cooking. 5. Stir the rice into the soup along with the chopped coriander. 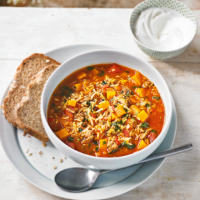 Serve in bowls with a spoonful of Greek yogurt and some soda bread on the side.